In the present study Scientific AmeriKen will explore the scientific and economic ramifications surrounding the observation that the wife prefers showers at extremely hot temperatures. Understanding the unique genetic and cellular resistance to such scalding discomfort will have many applications across various job types. However, the purpose of this experiment will be to rule out non-biological possibilities. Although differences in the tolerance to heat and pain of Scientific AmeriKen and spouse are unknown, there exist a height differential of one foot. It is the hypothesis of this experiment that heat dissipation of the shower stream will be significant enough to account for the preference of water temperature. Using a thermometer, the shower will be turned on and adjusted to the comfort level of Scientific AmeriKen. Temperature of the water will then be taken at the top, at a position where Scientific AmeriKen stands, one foot below that position and at the bottom (Figure right). To take a measurement of water, one hand will be cupped to collect water and the bulb of the thermometer will be placed for 10 seconds allowing a reading of temperature. Data were collected mid afternoon with an ambient temperature of roughly 21.1 oC (~70 oF). Cost of natural gas defined in units of CCF, CCF defined as "Amount of natural gas needed to heat 160 gallons of tap water to 130 oF"
The data presented here supports the notion that superhuman powers are not at work. Simple heat dispersion appears be the reason why the wife needs to set the shower heat higher to experience the same temperature shower. However, as calculated, the extra shower heat comes at a cost of an estimated $1.36 per year. In an attempt to prevent future cost, Scientific AmeriKen will propose the use of a stool (Figure right) during showers for wife. 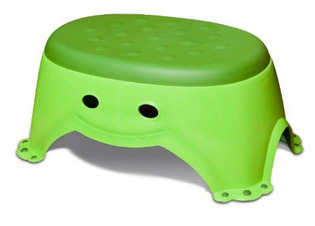 Current estimates are that the stool will pay for itself in approximately 7.5 years. Interestingly, the data here also show the preferred range of shower water temperature is fairly narrow at just a few degrees above body temperature 37 oC (98.6 oC. This preferred range is also substantially lower than the preferred temperature we previously reported for a warm beverage (45-55 oC, Link: Heat retention of water). These data will be officially classified under "hmmmm" and no further experimentation is planned in this area.